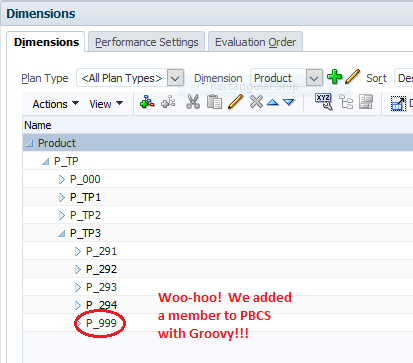 As part of a recent PBCS implementation, I had to design an Intercompany Elimination solution within a BSO plan type. This is a relatively uncommon and somewhat complex requirement in a PBCS implementation, and as such, I was pretty excited to blog about it. Unfortunately, the whole post nearly ended up in the garbage. Every once in a while, you write a great post, only to find that someone else has covered the topic sooner than you, and better than you. In my case, that person was Martin Neuliep. In Developing Essbase Applications: Hybrid Techniques and Practices, Martin shared a single formula that elegantly calculated Intercompany Eliminations in a BSO cube. In addition, Martin was scheduled to discuss the topic of eliminations at Kscope in his presentation on June 28th, titled Eliminating the Eliminations Problem in Essbase. Luckily, I had an ASO solution in addition to my BSO approach. As it turns out, Martin was planning on sharing several elimination calculation methods in his presentation (some developed by him, and some developed by others). Perhaps my ASO solution will make the cut? (hint, hint) Either way, you should check out his presentation – I will definitely be there. With all of that said, here’s my approach to intercompany eliminations in an ASO plan type. Most of my clients create their Budgets and Forecasts in a “fully eliminated” manner. Within their financial plans, they pretend that certain transactions don’t occur, because these transactions don’t affect the company’s bottom line. If one subsidiary has a planned (future) transaction with another subsidiary, these clients may not bother recording the transaction in their Budget or Forecast at all. While this approach simplifies the planning process, it leaves out financial details that may be useful. When a client’s requirements indicate that these transactions are relevant to the planning process, we need to build Intercompany Elimination logic into our PBCS applications. The accounting behind these transactions can get pretty complex, but what we’re going to focus on today are the technical mechanics that facilitate these eliminations in PBCS, specifically in an ASO plan type. So why do we eliminate these transactions? Because depending on where we’re looking in the Entity dimension, we need to pretend that they never occurred. As far as most investors are concerned, these intercompany transactions don’t count on a consolidated basis. Imagine selling a car to your spouse . . . this transaction doesn’t change your combined income or net worth. This leads us to an interesting question. When and where do we eliminate these transactions? 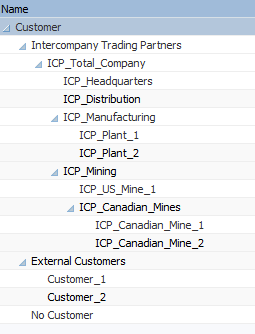 Note that all members under Intercompany Trading Partners correspond with a member from the Entity dimension exactly, but with an “ICP_” prefix. This ASO solution will not work if there are discrepancies between Entity dimension members and the members underneath Intercompany Trading Partners. 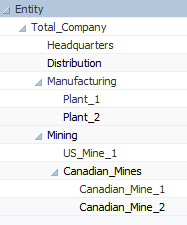 If we were to look at Total Sales for US_Mine_1, we would want to see $100 in sales. But what if we wanted to see Total Sales for Total_Company? Assuming that this was the only sale, we would want to see $0. This is because the transaction must be eliminated at the first common ancestor between the Entity and the Intercompany Trading Partner. Total_Company is the first common ancestor between US_Mine_1 and Plant_1. What makes this calculation interesting is that the transaction should NOT be eliminated at ancestors before we arrive at the first common ancestor. So we would definitely expect to see that $100 in sales to show up in the parent member Mining. The ins-and-outs of these transactions can get tricky, especially when mixing many transactions together with both internal and external customers. Developers will likely have multiple sets of accounts being eliminated. (E.g., Sales & Cost of Sales, Receivables & Payables, etc.) Ragged hierarchies and alternate hierarchies can add additional complexity. For this reason, it can be helpful to introduce “E-Companies” into the Entity dimension. These are basically fake companies where we only calculate and store elimination data. Unfortunately, E-Companies can make an Entity dimension convoluted. If your company structure is particularly large or volatile, E-Companies can create a significant amount of maintenance. They can also be confusing to end-users who might not understand their purpose. 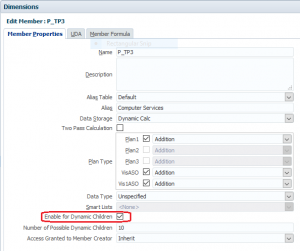 ** NOTE – Most intercompany elimination solutions in BSO databases require E-Companies! One of the nice things about PBCS implementations is that they often include an ASO reporting database. In fact, some clients never consolidate their BSO databases at all, and instead, simply map their data to an ASO cube that rolls everything up on the fly – no business rule required! And here’s where things get really awesome – in an ASO database, we can calculate intercompany eliminations without the need for E-Companies. Both an Entity dimension and a Customer dimension are required. The Intercompany Trading Partner hierarchy (within the Customer dimension) must match the Entity dimension exactly, with the exception of “ICP_” prefixes. This includes intermediate parents. 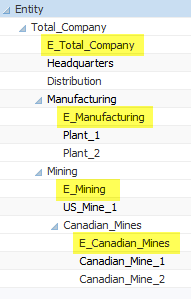 A “Data Source” dimension of some type is required to separate regular data from eliminations. Account dimensions in ASO databases are automatically set to Dynamic. 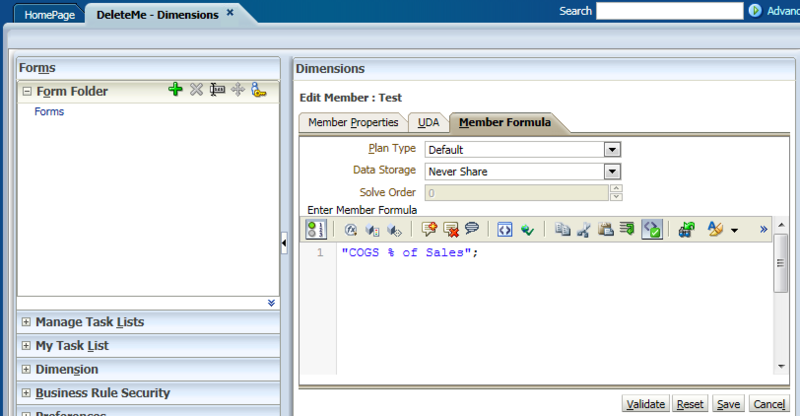 The Data Source dimension will also need to be dynamic to support member formulas. In this solution, all of the logic associated with eliminations lives in a dimension called Data Source (or something similar). 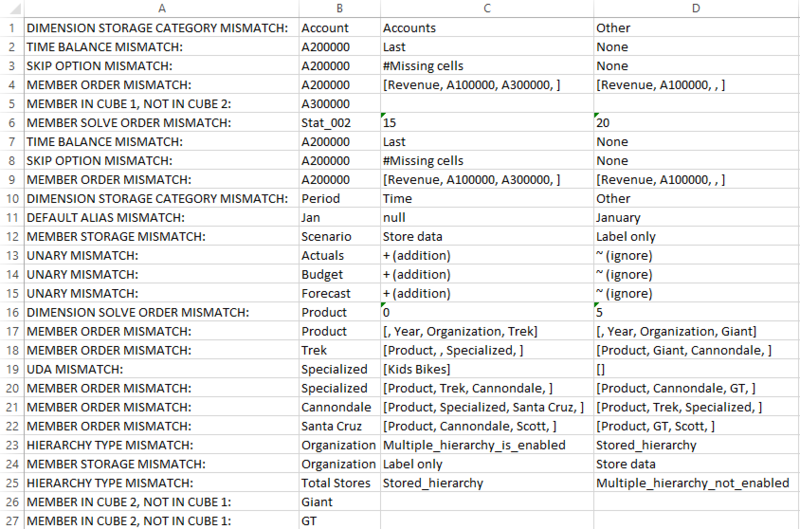 In this dimension, all base (non-eliminated) data is loaded into a member called Amount. This dimension also includes a special “Do Not Use” system-only type of member. Here, it is called Do_Not_Use_Elim. We generally do not want users querying this member. It’s just a temporary holding spot for storing the inverse balance for any intercompany accounts. This member can be populated with a procedural calculation. It is important to note that the “Do Not Use” member should be populated in the same member combinations as the original budgeted amount, with the exception of the Data Source dimension. Remember – this “Do Not Use” member is simply a holding spot. Users should not query this member. The “real” magic happens in the member above called Elim. 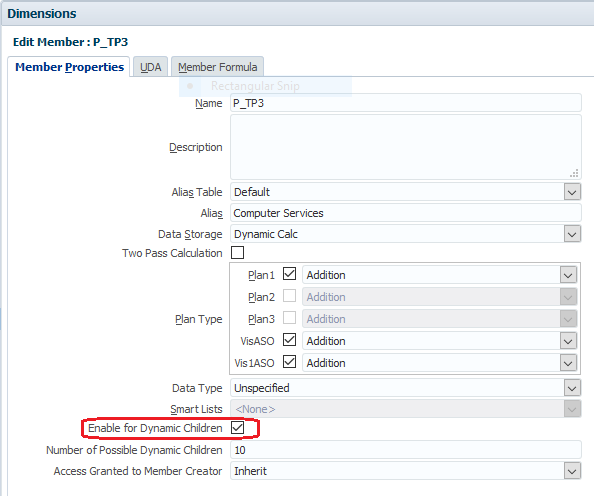 In this member, a formula is added that filters when eliminations (stored in the “Do Not Use” member) are displayed and subsequently added to the base data. The example above shows our original sale (row 3) and the inverse amount stored in the “Do Not Use” member (row 4). Rows 7-10 show our original Entity and its ancestors. We can see that the eliminations are only displayed at the first common ancestor and above (row 9 – 10). Finally, in rows 13 – 16, we see the view that most users will retrieve, using the member Consolidated_Amount. This member takes the base data in the Amount member and layers in the data in the Elim member. As such, we can see that the sale exists in rows 13 & 14, but is eliminated in rows 15 and above. Like most calculations in PBCS (and Essbase in general), there are multiple options for solutions, each with its own pro’s and con’s. This solution works well against very large databases and has the added benefit of not requiring E-Companies. Happy Eliminating! This post is late. It’s embarrassingly late. But it’s finally finished, and I hope you find it useful. The features above are useful for tasks like loading data and metadata into an application because we often have to place files into the Inbox/Outbox before we can reference them with Data Management or as part of a job. Part of setting up PBCS involves defining a Maintenance Time. During this one-hour window, the application is backed up (nightly) and an Application Snapshot is created. The application snapshot contains everything necessary to restore the application, including data, metadata, forms, security, reports, business rules, mappings . . . you name it. Only one Application Snapshot is maintained in the Inbox/Outbox. It gets overwritten every night, so if you want to keep a rolling set of backups, you will likely want to automate and schedule the export of these files. When we talk about an LCM Export, we are generally talking about a more focused artifact export, initiated by an admin. For example, when a developer wants to migrate a specific set of artifacts from the TEST instance to PROD. But technically speaking, an Application Snapshot is an LCM export . . . it’s just the automated nightly export that includes all artifacts and data. We previously stated that the Inbox/Outbox only maintains the most recent Application Snapshot, so why would we bother listing these files? There’s only one of them at any given point in time, right? Well it turns out that when you use the Migration API to list Application Snapshots, you’re really just listing all files in the Inbox/Outbox. 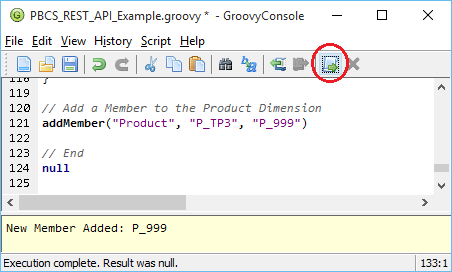 In fact, you may have noticed that the listFiles() function in the Groovy Common Helper Functions uses the URL for “/application snapshots”. It’s interesting to note that the files in the Inbox/Outbox are classified as either “LCM” or “External”. 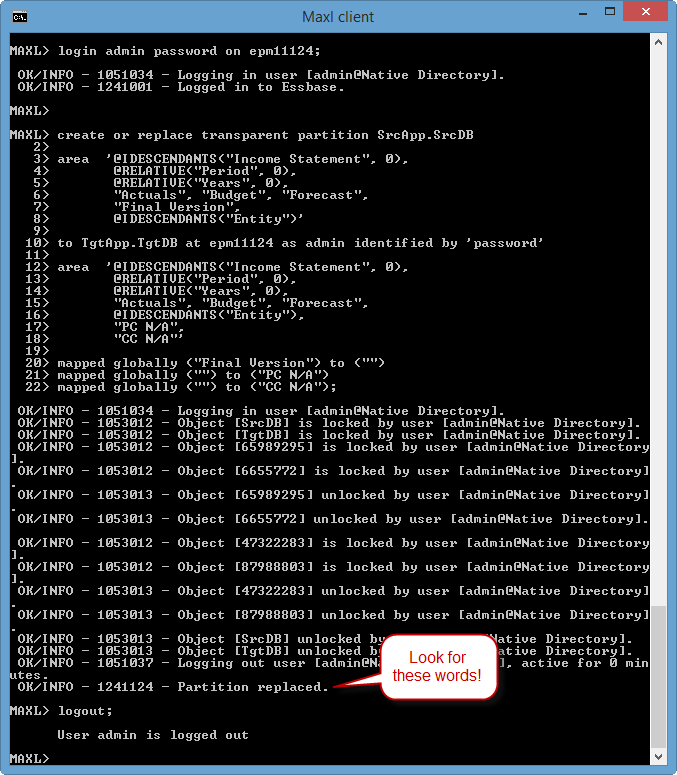 LCM files include Application Snapshots and anything exported using LCM. But curiously, this property also applies to internal Inbox/Outbox directories. “External” files make up the remaining contents of the Inbox/Outbox. These are usually files uploaded for data and metadata. We can see this LCM vs External designation by adding the code circled in red below to the listFiles() function. Downloading Application Snapshots is one of the more useful aspects of the Migration API, as most clients want to keep a rolling set of files over a given time period. Because the Application Snapshot in the Inbox/Outbox gets overwritten every night, it’s important to download this file in an automated and scheduled manner. Downloading an application snapshot is just like downloading any other file, however there are a couple of “gotchas”. While all of the Migration API documentation refers to the “Application Snapshot”, the actual file that gets produced nightly in the Inbox/Outbox is called the “Artifact Snapshot”. Another unusual fact about this file is that it has no file extension, even though it is a .zip file. If you want to easily browse the contents of this file, you’ll need to add the .zip file extension once downloaded. 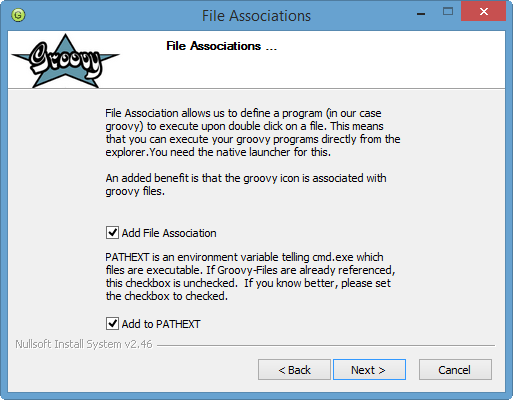 Other than those two items, the Application/Artifact Snapshot can be downloaded using the downloadFile() function in the Groovy Common Helper Functions. Please see the previous post here with some useful updates to this function. Uploading an application snapshot is similar to uploading any other file to the Inbox/Outbox. With that said, I have not been successful in uploading a previously downloaded Artifact Snapshot without first updating the file name. 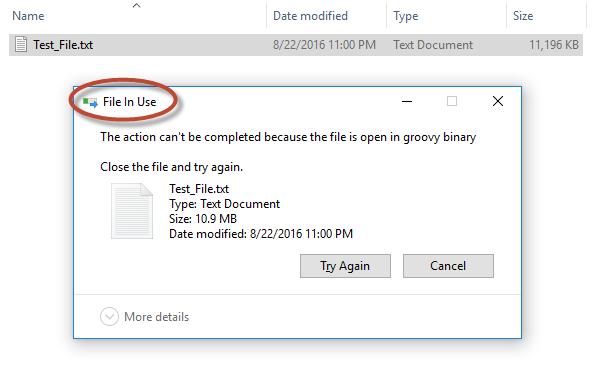 This is because the nightly “Artifact Snapshot” file has a space in the file name, and has no file extension. Remove the space and add a “.zip” file extension and everything works as expected. But I have to ask, why would Oracle produce a download file that cannot be uploaded in its original state? It may have something to do with the fact that Oracle can’t be sure which operating system exists on the target file system, and different operating systems use different file compression programs. Regardless of the filename, the Migration API will recognize that the file being uploaded is an Artifact Snapshot (as opposed to any other file being uploaded to the Inbox/Outbox), however the file must have a “.zip” file extension. LCM Exports initiated via the Migration API aren’t especially intuitive, however once you know how they work, they’re pretty flexible. I’ll explain . . . in order to execute an LCM export using the Migration REST API, users must first execute a successful export via the PBCS interface. Once that has been done, developers can re-execute that same export using the API. My initial reaction to this approach was concern. What if I setup a process in the PBCS user interface that archives all of my forms? Will that export contain a hard-coded list of forms, missing any future artifacts I might add to the application? The answer is no (and yes, depending on how you specify your artifacts). If I tell LCM to export all of my forms (without selecting any individual forms), then any new forms added at a later date will get picked up in future exports initiated using the API. If I specify specific forms in the initial selection using the PBCS user interface, then only those specific forms will get exported in the future when using the API. Navigate through the Artifact Categories, and select the objects you want to export. Remember that selecting an artifact category will allow future exports to capture newly added artifacts, while selecting specific artifacts within categories will limit future extracts to those just those specific artifacts. At this point, you should have a fresh LCM export sitting in the Inbox/Outbox. I wouldn’t typically automate an LCM import into an application, however this could conceivably be useful if you’re refreshing a number of testing or training environments on a regular basis. To import a snapshot using the Migration API, first copy the importSnapshot() function from the Common Helper Functions for Groovy. Then add the line highlighted below and run the script. 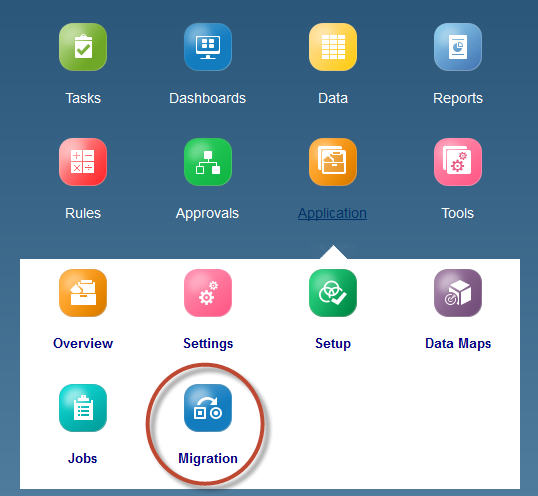 A quick check of the Migration Status Report will confirm the success of your LCM import. 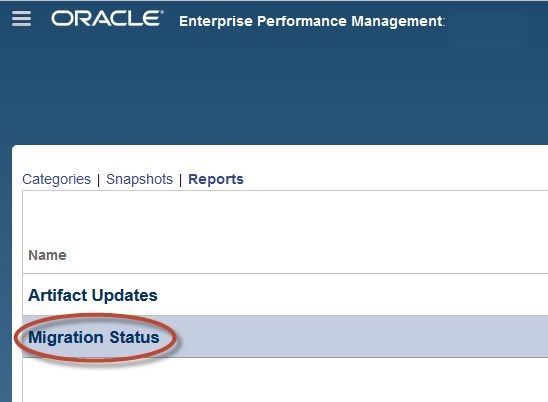 It is important to note that the User Provisioning Report will be placed into the Inbox/Outbox. From there it can be downloaded automatically with the downLoadFile() function. While the User Provisioning Report will highlight all of the roles assigned to a give user (including the group through which they inherited a role), the User Audit Report shows when the user accessed the application and their associated IP address. This report doesn’t address specific activities undertaken within the application, but rather the fact that the app was accessed. Like the User Provisioning Report, the User Audit Report will be placed into the Inbox/Outbox. From there it can be downloaded automatically with the downLoadFile() function. So there you have it! You can now automate backups, migrations and usage reports using the REST API’s. Oracle provides specific REST APIs for many of its cloud offerings, however one API in particular is useful for multiple cloud products – the Migration API. This API is sometimes referred to as the “LCM” API or the “interop” API. Regardless of the name, this is the API that provides Lifecycle Management functionality for EPM Cloud products. 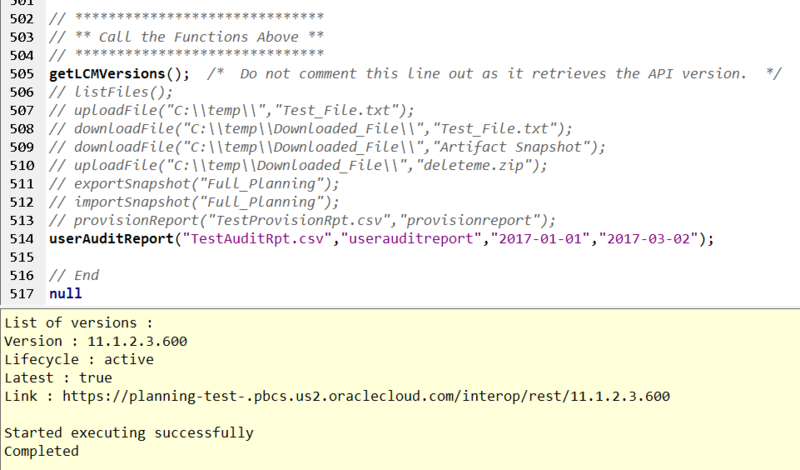 If you’ve never worked with any of Oracle’s EPM REST APIs, have a look at my previous post here on the PBCS REST API. This will give you some context and background on the subject. 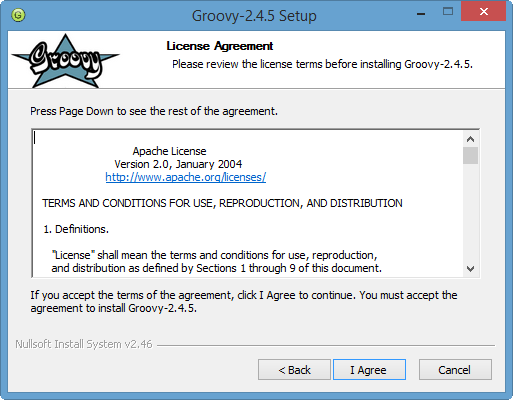 We will be using Groovy for all examples. 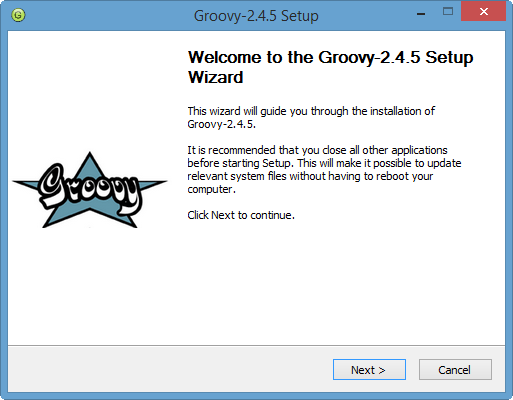 Steps for installing Groovy can be found within this post. Some of the tasks above are not great candidates for automation. For example, it would be highly unusual to reset your service instance in an automated manner. I also wouldn’t recommend sending Oracle feedback in any automated fashion. They may have some “feedback” for you . . . with that said, there are some extremely useful features of the Migration API, and we will cover them below. A Word About the Common Helper Functions . . .
As noted in previous posts, the Common Helper Functions offer a significant head start in automating an EPM environment. This post will reference many of these functions while illustrating how to put them together into a cohesive script. ** NOTE – Each section below has a link where readers may download the code samples. Next, we must define variables for our EPM environment and authentication. If you’ve read my previous post on the PBCS REST API, these should look familiar. You will need to update these with your instance information and credentials. 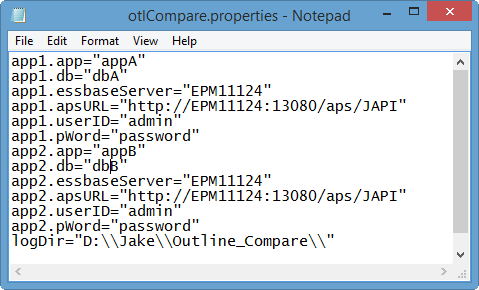 It’s important to note that the API versions for the various EPM products can differ. The current version for the PBCS API is “V3”, however the Migration API version is “11.1.2.3.600”. Several functions require the API version, and they will not work if the wrong API version is passed as a parameter. 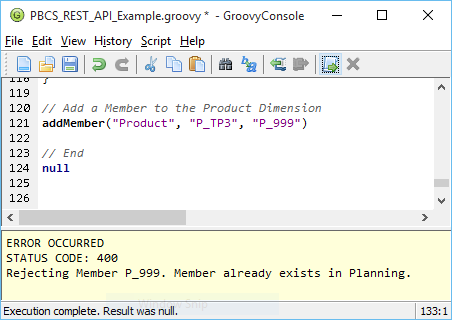 Copy and paste these functions into your Groovy script below the EPM Instance Variables, then insert a line to call the getLCMVersions() function. At this point, your code should look something like this. At this point, it’s a good idea to define a variable apiVersion, and assign that variable a value within the getLCMVersions() function. 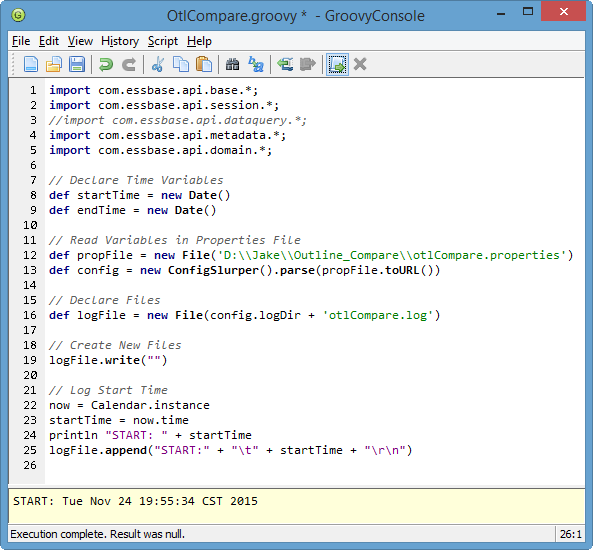 Run the script and review the list of files in the Groovy Console output window. At this point, your code should look something like this. Note that the sendRequestToRest() function leverages a third-party library called JSON-lib. 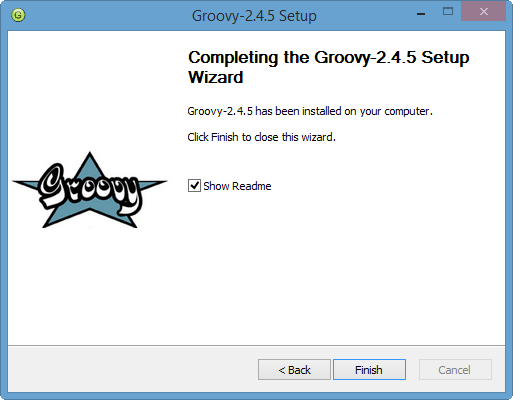 To use this library, download the java-json.jar file from http://www.java2s.com/Code/JarDownload/java/java-json.jar.zip and unzip it into the C:\Program Files (x86)\Groovy\Groovy-2.4.6\lib directory. 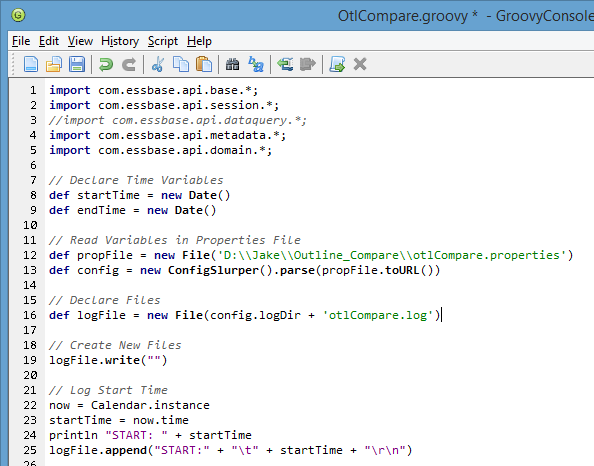 Add the following line (highlighted in yellow) to the top of your Groovy script and you’re ready to go! Notice that the file path gets baked into the file name. We didn’t want to upload a file called “C:\Temp\Test_File.txt”. We wanted a file called “Test_File.txt”, and it just happened to be originally located in the C:\Temp directory (which is irrelevant once the file is uploaded). Next, call the uploadFile() function with two separate parameters for the directory and file name. Note the double-slashes below. Running the script now uploads the file to the Inbox/Outbox with the correct file name. After making the changes above, developers should be able to download files from the Inbox/Outbox to any local directory. 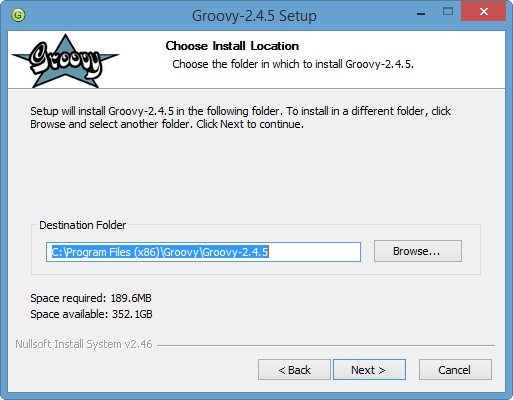 Test the downloadFile() function by calling it at the end of the Groovy script. Note the two parameters used by the function. If you’ve been following along this whole time, that’s awesome! Your code should look something like this. Bed Time . . . In Part 2 of this post we will cover the remaining aspects of the Migration API . . . Artifact Snapshots, LCM and User Reports. Check back soon – I should have it posted by the end of next week! I’m speaking at OpenWorld this year! My presentation on Essbase Hybrid Aggregation Mode will be in Moscone South – Room 303 on Sunday 9/18 at 1pm. During the testing phase of most Planning implementations, developers need to create test user accounts. I typically create at least one test user for each security group so I can verify that the correct access has been assigned. With an on-premises Hyperion Planning implementation, this is easy – simply create user ID’s in the Shared Services native directory. With PBCS, creating bulk test ID’s can be difficult, as each user ID requires a unique e-mail address. 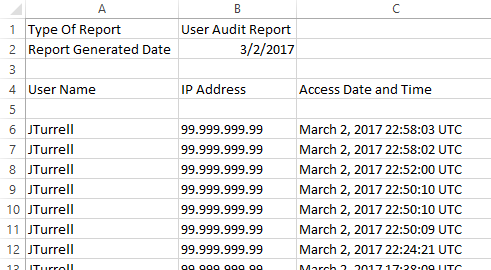 If you need 50 test users, should you create 50 fake/temporary e-mail accounts? Luckily the answer is no. The Easy Way . . . I created a free Gmail account with the e-mail address pbcstest@gmail.com. If I try to use this same e-mail address for all six of my PBCS test accounts, I’ll get an error. Each account requires a unique e-mail address. However I want to manage all of my test accounts from a single e-mail address. 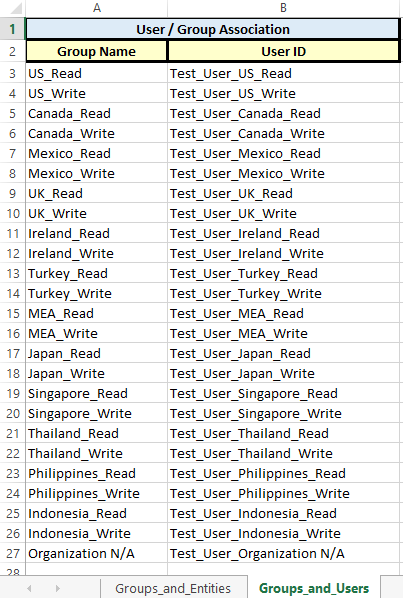 To do this, I need to use a “+” sign in the e-mail addresses of my test users. When Oracle Cloud sends the user ID confirmation messages with temporary passwords, they will all be delivered to pbcstest@gmail.com. For many years, developers have had access to a variety of Essbase API’s that allowed them to write their own programs to automate and interact with their Essbase environments. 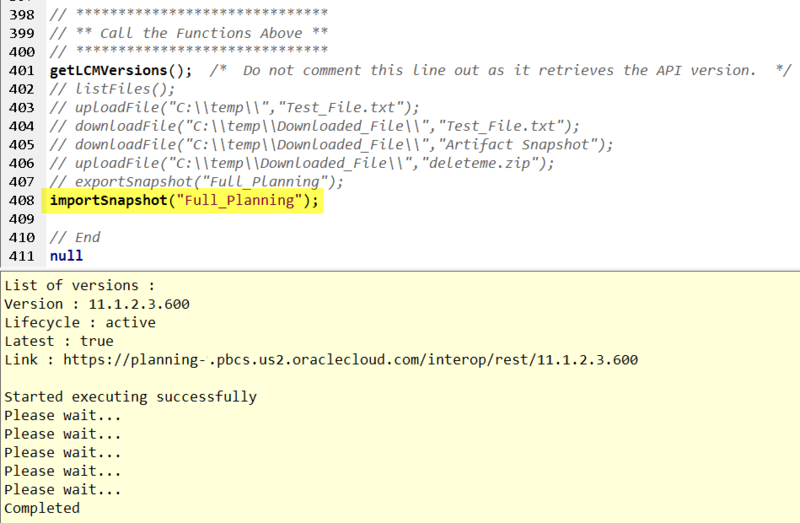 Hyperion Planning, on the other hand, has had pre-built “utilities”, but it never had anything approaching a true API. 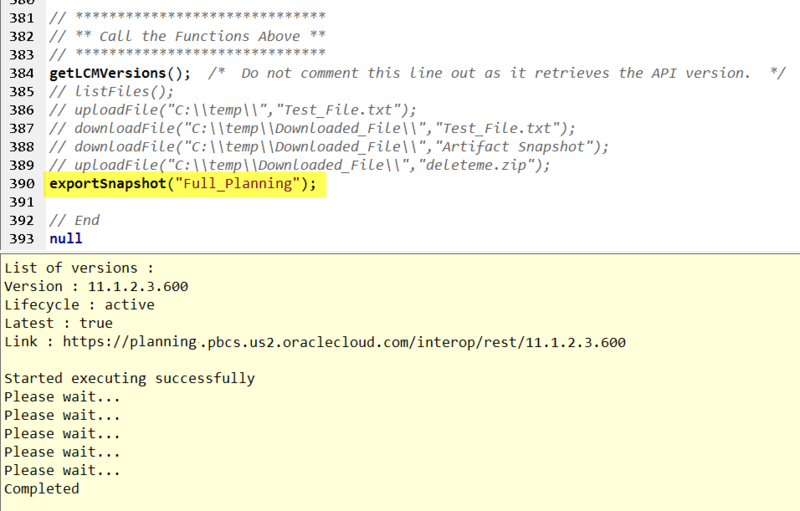 With the release of Oracle Planning and Budgeting Cloud Service (PBCS), we now have access to the PBCS REST API. So why is this important? Automation capabilities affect software adoption (aka sales for Oracle). When you think about it, PBCS offers some truly amazing benefits. It’s cost-effective compared to on-premises environments. It’s faster than many on-premises environments. Administrators don’t have to worry about upgrades or maintaining complex infrastructure. PBCS gets new features long before on-premises. PBCS practically sells itself, right? If PBCS is cheaper, better, faster and easier than on-prem, what could possibly make an organization hold on to their on-prem environment? For many, it’s the thought of having to rebuild the automation and integration that has been built up around their on-prem applications over the years. Many of the tools and techniques for automating an on-prem environment will not work with PBCS. But while the idea of tearing out years of work related to data integration and application automation can be daunting, it is doable. Let’s look at some options. The primary tool used to automate PBCS is aptly called the EPM Automate Utility. This command line utility allows admins to import and export data and metadata, refresh apps, run business rules, etc. It also allows administrators to upload and download artifacts to the PBCS repository (think automated LCM). The EPM Automate Utility has been discussed extensively in other blogs. It’s well documented and easy to use (albeit somewhat limited). We are going to cover something much more interesting. Oracle’s recent cloud offerings are designed to be RESTful. This means that they conform to a REST (representational state transfer) architectural style. More importantly, it means that apps in Oracle’s cloud are accessible with a REST API. As a matter of fact, the EPM Automate Utility was built on top of the REST API for PBCS. So why would a developer choose to build a program in Groovy, Perl or PowerShell if they could simply create a batch file that calls the EPM Automate Utility? Because, like all utilities, the EPM Automate Utility has a limited set of commands and invocation methods. The PBCS REST API opens up possibilities for creative and elaborate automation and integration, using many different languages. Java is installed on your PC. You are familiar with the REST API documentation. 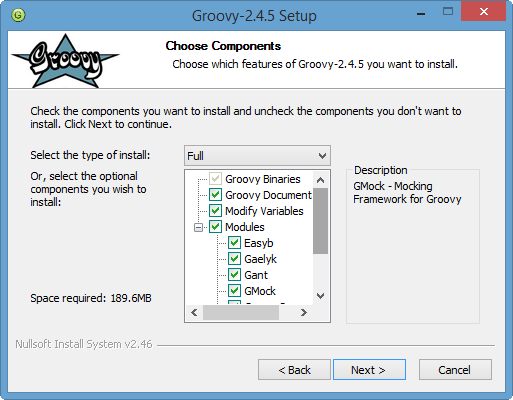 You have reviewed the Common Helper Functions for Groovy. Please don’t be too concerned with that last point. I didn’t know what JSON was before I started working with the REST API for PBCS. It’s basically a data structure for passing lists and arrays between web apps. Another function omits an important slash. This causes the function to return html/text content instead of json/application content. This was fairly confusing to a new REST API developer! I would personally like to see some comments added to these samples. With all of that said, they are extremely helpful when getting started with the PBCS REST API, and are definitely worth review. The settings above are “sticky”, so developers will only have to set them once. The JSONObject library will allow the script to transmit data in a JSON format. 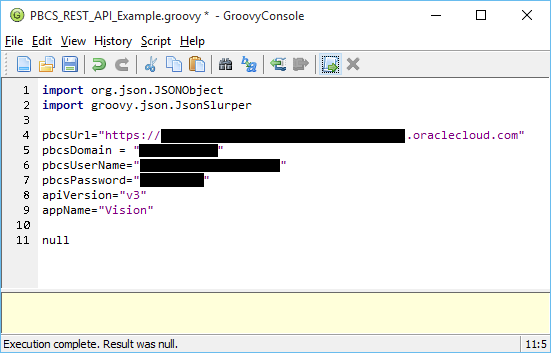 The JsonSlurper library (included when you install Groovy) will allow the script to parse JSON data. 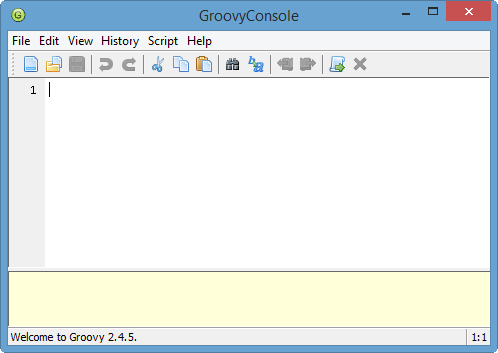 Type the code below into the GroovyConsole (or copy/paste from here). 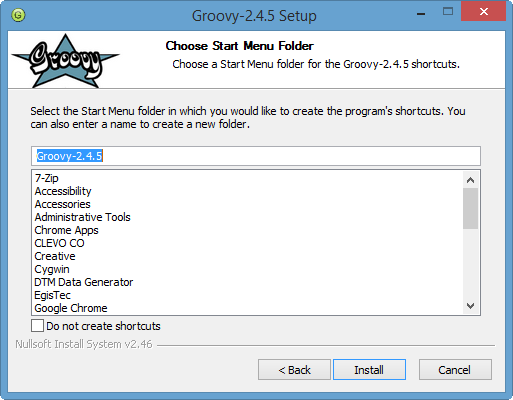 Press the Execute Groovy Script button highlighted above. Ensure that the completion notice is successful. If the notice states anything other than “Execution complete. 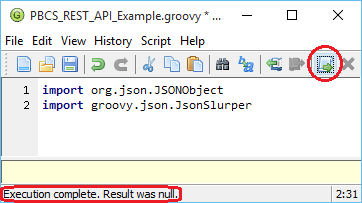 Result was null.” there is a good chance that the java-json.jar file was not extracted into the correct location, or the GroovyConsole was not restarted. Be sure to update the URL, domain, user ID and password for PBCS (redacted above). This example will be using the Vision sample application. If using a different application, be sure to update the app name. The PBCS REST API expects credentials to be sent in the following format: identitydomain.userID:password. In addition, authorization information is sent in an encoded format. The code below accomplishes this. 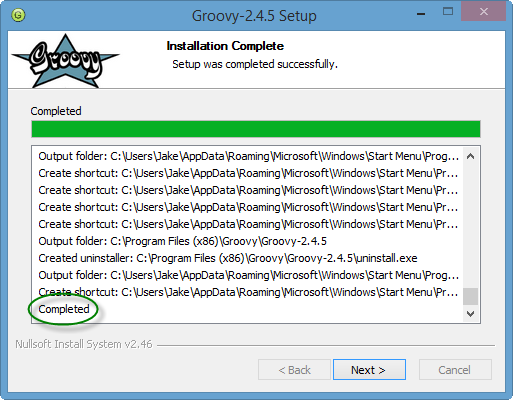 Next, we will borrow several bits of sample code from the Common Helper Functions for Groovy. The two functions below read input from our REST requests and slurp it into JSON structures. This sounds complex, however it’s really just reading a long string and placing the data into a more usable format. 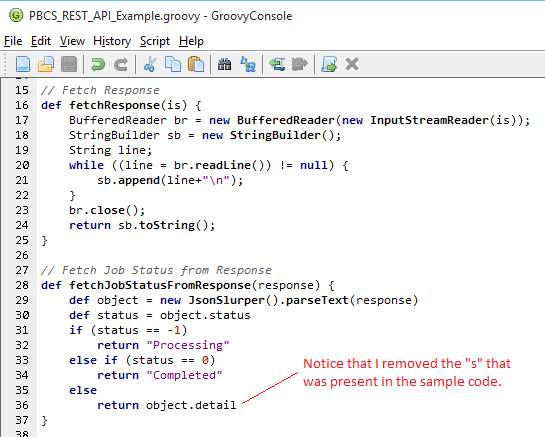 Another important bit of borrowed code is the executeRequest function (also included in the Common Helper Functions for Groovy). 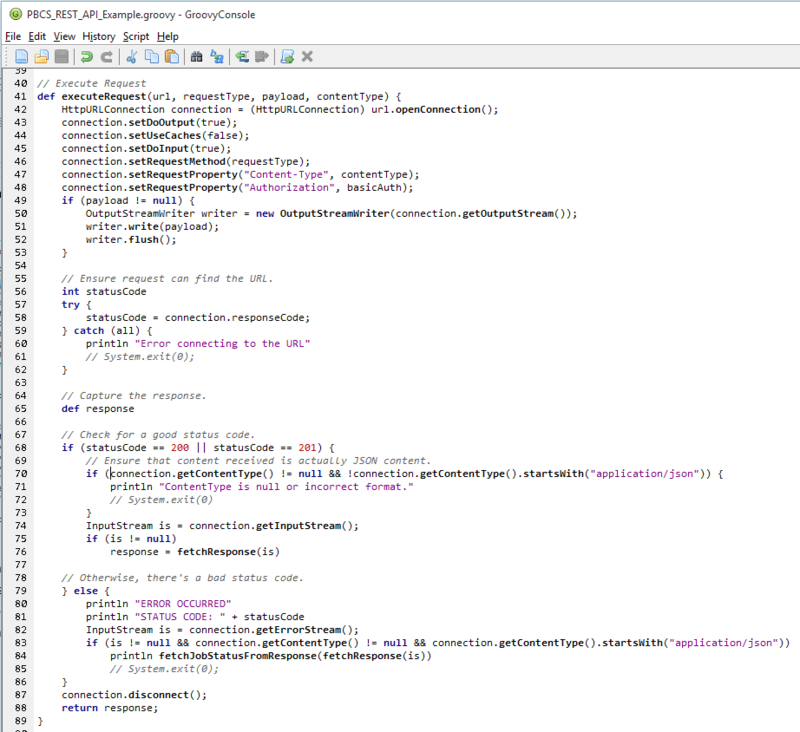 I have made some slight modifications to this code to make it more readable while adding some comments. This function calls the two “fetch” functions above, and is responsible for assembling and executing our REST “request”. At this point, we have three functions, all geared towards asking the PBCS REST API to handle a request. Now it’s time to actually construct a request and execute it. We will do this by building a function called addMember. We are going to add a Product to the Vision PBCS application. It is important to note that the parent to which we are adding this member must be enabled for dynamic children. We are going to add our new Product to the parent P_TP3. I wrote the function below to add members to a dimension. For demonstration purposes, we are only adding the required properties (parent and member name). In a “real” application, we would include more properties and they would vary depending on the type of dimension being addressed. The function above simply assembles these four items and passes them to the executeRequest function. Step 7: Test the Code! Before we start our test, let’s look at the Product dimension in the Vision app. Here we see that our parent member P_TP3 has four children. Our function should add a new child called P_999. Let’s run our script and see what happens! 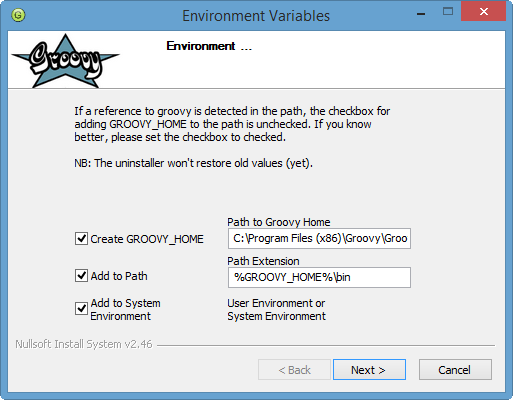 Press the Execute Groovy Script button. Our script output says that the member was added to PBCS. Let’s look in Planning and make sure. What happens if we try to add the member again? As expected, PBCS won’t let us add a member twice. If you don’t receive the error details above, you probably didn’t fix the defects I showed you with the sample code. This was a very simple demonstration of the PBCS REST API, but there are some complex use cases for this type of automation. Many other sites on the web are RESTful. Imagine a process that builds hierarchies automatically based upon data from other websites. What about a set of functions that automatically update FX rates in your Planning apps? With the PBCS REST API, you can get very, very creative. Agatha Christie once argued against the notion that necessity is the mother of invention. She said, “Invention, in my opinion, arises directly from idleness, possibly also from laziness – to save oneself trouble”. This is the guiding principle I follow when designing and building security models for Hyperion Planning and Essbase. So how can a bit of laziness take the “trouble” out of EPM security? By leveraging Excel and letting formulas do the heavy lifting. This is an approach I’ve been using for over a decade, and I’m certain I’m not the only one. Although some of the tools have changed (think LCM), the general approach has been the same. Step 1: Create a user-friendly, table-like input worksheet where administrators can enter security information. Step 2: Create separate “export” worksheets for each of the basic components of EPM security (Shared Services, Essbase, Planning, etc.). Step 3: Take the content from the input worksheet(s) and link it to the “export” worksheets with formulas, placing everything into the correct format. Step 4: Import security & check for errors. Let’s look at a simple example. Keep in mind that based upon your particular requirements, this approach can have a lot of variations. For example, you may not be able to create your own groups, because your organization prefers groups to be maintained in Active Directory. In our example, we’ll use native Shared Services users and groups. The same principles apply . . . you’ll just have to tweak things a bit. In our example, our administrator has to maintain security in a Hyperion Planning application and a native Essbase reporting cube. The applications both have the same users, and they have similar security requirements. We’ll use my Starbucks Hyperion Planning demo. It contains all of the global Starbucks, Teavana and Seattle’s Best Coffee locations. (The locations are real, but everything else is made up . . .) We’ll create groups for the 12 main countries/regions in which Starbucks operates. In the examples below, an Excel workbook will be highlighted. The full workbook can be downloaded here. What are the groups with access to the EPM products? What members can these groups access? What is the level of access? Who is in the groups? Here is what our simple input worksheets look like. 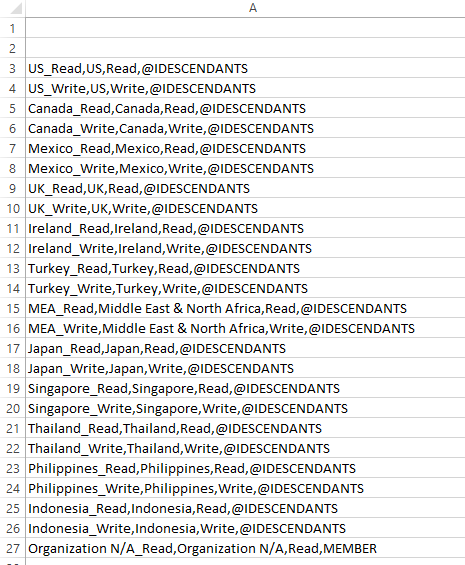 In our example, we will create 24 groups (one read and one write for each country/region). We will also add one test user to each group. We will assume that all groups have access to both Planning and Essbase. What are my groups and what can they access? Who is in my groups? Now that we have collected the basic information we need, we can begin to create our outputs. These are the files that we will import into Shared Services, Essbase and Planning to actually build our EPM security. 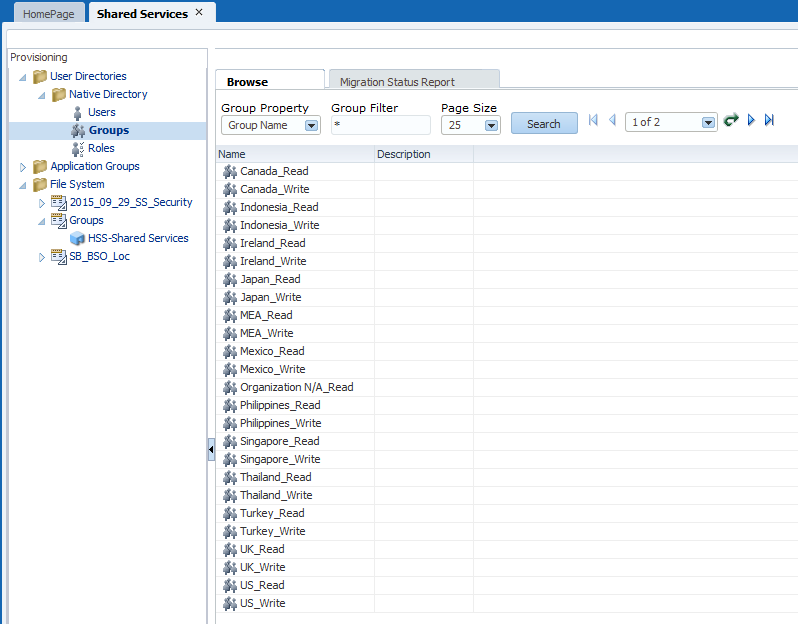 Manually create one native group in Shared Services. Manually add a user to the group. Next we need to export the security we just created manually in Shared Services. This will give us an idea of what the Shared Services import files should look like. Note that even groups and users that were created in Active Directory will be exported when the “Native Directory” above is selected, assuming they have been provisioned. If we edit the Groups.csv file, we can immediately see the format of the file we need to create that will ultimately be used to create the new native groups in Shared Services. In this file we see the group that was previously created manually and we see the test user that was assigned to the group. ** Note - Leave the internal_id above blank when creating the new import file. ** Note - If you’re using Active Directory users or groups, your providers will be slightly different. Using the same basic format as our exported Groups.csv file, we can create a new file (within our EPM Security Workbook). This file will create our groups and associate our users with the groups. 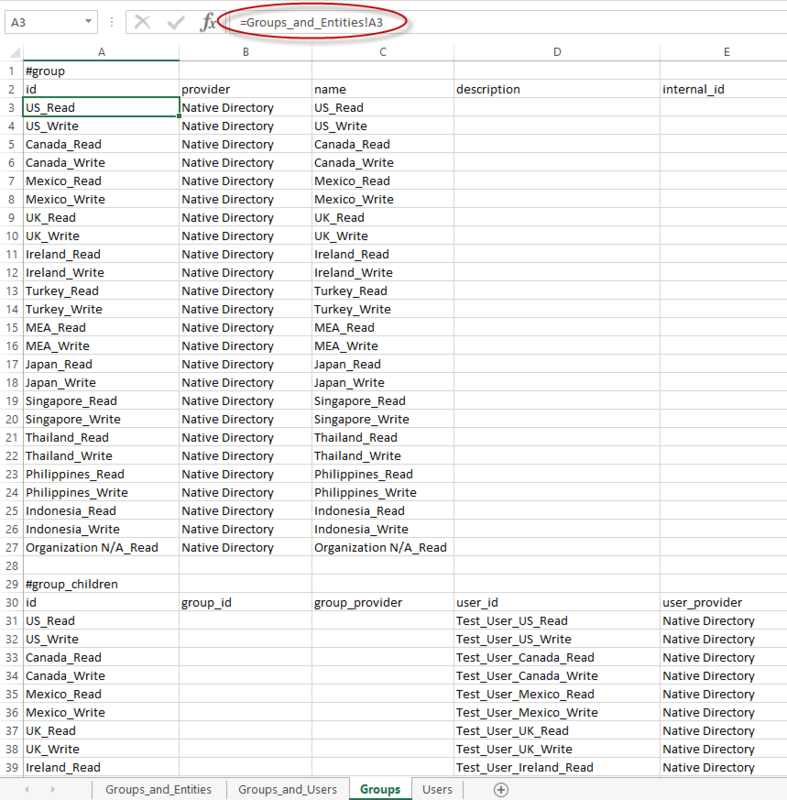 It’s important to note that many of the cells below are populated with simple formulas that reference the Groups_and_Entities or the Groups_and_Users worksheet. Note the formula circled below. This file can either be saved as the Groups.csv file (in the previously unzipped folder structure), or the administrator can copy and paste the results into the Groups.csv file (the one previously exported from Shared Services). Then, simply zip the files back up (starting at the top of the LCM file structure). From within Shared Services, right-click on the File System. Select Upload. Browse to the zipped Shared Services files. Select Finish, then OK.
Next, expand the file within the Shared Services File System. Select the Groups. 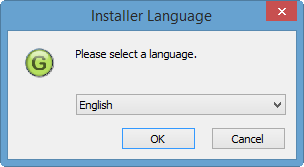 Select Import. Ensure that the groups were created successfully and that the users were added as expected. Now that the groups are imported and the users have been added to the groups, it’s time to provision the groups. Navigate to the Assigned Roles directory in the previously exported LCM file. 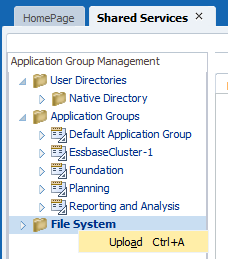 Re-zip the Shared Services LCM files, upload the file and import the Planning Assigned Roles. At this point, all of the groups should be provisioned as Planners. Repeat this process and provision the groups for Essbase and FR (based upon the files previously exported containing our manually created test group). Groups must be provisioned in Shared Services for Essbase and Planning before application-specific security can be applied. Woo hoo! At this point, we’re finished with Shared Services and LCM. All of the groups have been created. Users have been added to the groups. All of the groups have been provisioned. And all of this has been done by importing files built based upon simple formulas. Next we need to create our Essbase filters. For this, we will use Excel formulas to craft MaxL statements. 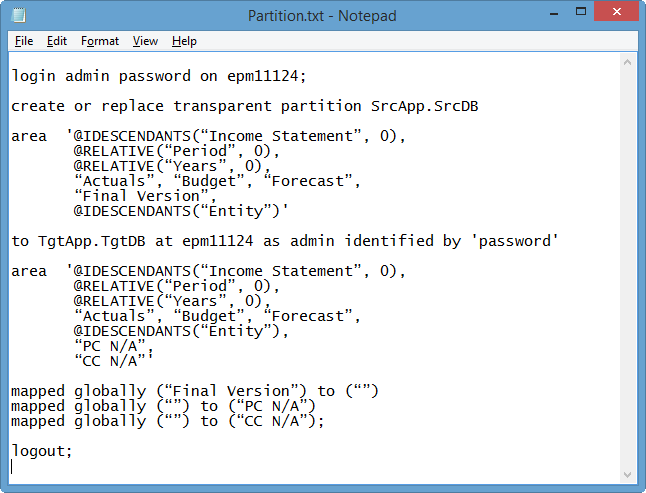 We can paste these statements directly from Excel into the MaxL command prompt. Let’s start with the basic MaxL that we want in our Security workbook. The MaxL syntax can be found here. Note the common practice of locking down a dimension with “no_access” and then selectively opening it up with read or write lines. 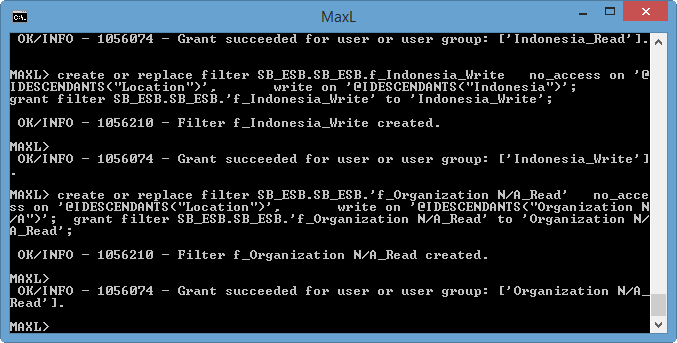 If we paste the MaxL into a MaxL command line, we’ll see that the filter is created and granted to the specified group. But what if we want to create these commands in bulk in Excel? We simply use formulas with the concatenate function. Note the use of spaces and quotes in the formulas above. 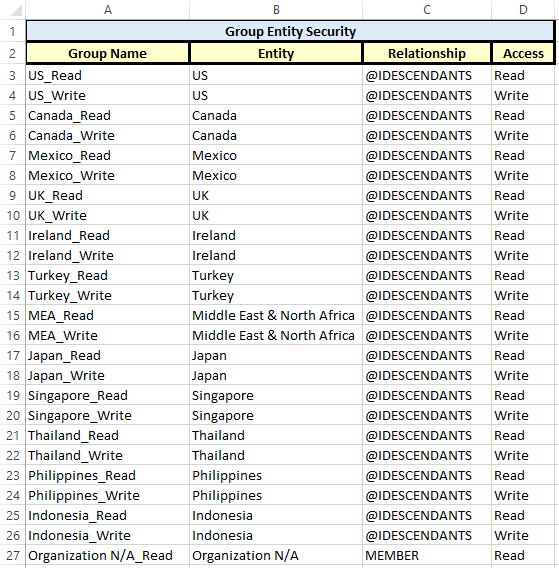 Also note that by placing the words “read” or “write” in the actual group names, we can reference this in the formulas when building the filters, thus granting either read or write access. Once our formulas are sorted, we can simply paste the MaxL directly from Excel into a command prompt. Our filters are immediately created and granted to all of our groups. Subsequent changes are as easy as a copy/paste into MaxL. The last step in our process is to create the file to import security into our Hyperion Planning application. Again, we will use Excel and basic formulas. Like LCM, it can be helpful to add a minimal amount of security to Hyperion Planning manually, and then export a sample secfile.txt file. This can be helpful when determining the format of the import file. Review the security export file. We can now craft our full import file using this same format. Building security manually is a tedious, time-wasting exercise. And in the end, administrators are left with a manual process to maintain. 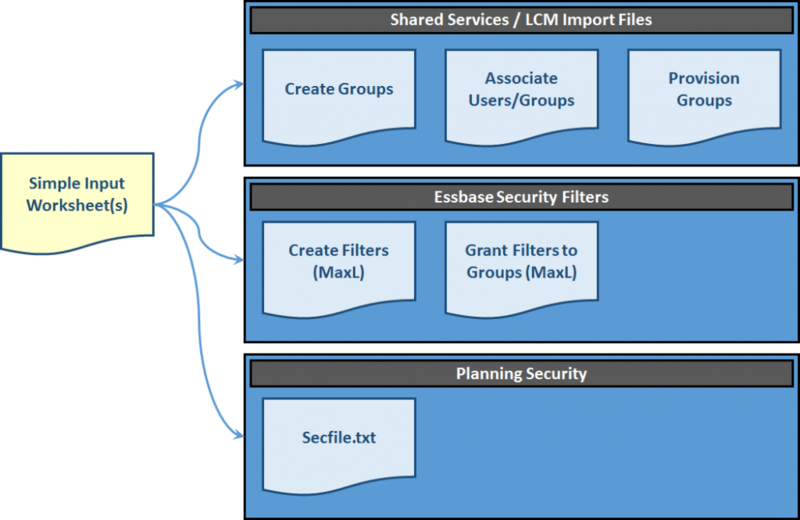 By centralizing security development in an Excel workbook, developers can create exports that feed the various EPM components. While these exports require different formats for LCM, Essbase and Planning, the mechanics that produce the files are similar. Developers can use basic Excel formulas to craft files into the correct import file formats. Then import the files. EPM Security Maintenance is centralized in a single workbook. The EPM Security Workbook makes a good security backup. The EPM Security Workbook can be versioned and archived. Security migrations are simplified because the same files can be imported across multiple environments. Importing files is infinitely faster than creating security manually. A copy of the workbook used in these examples is available here. Excuse #1: My current project is in “sprint” mode with some aggressive development timelines. Excuse #2: I’m working on my presentation for Top Gun 2015 US. Excuse #3: I have a new toy. I wouldn’t normally blog about that last excuse (the toy), but I’m going to try to tie it in with Excuse #2. On September 17th, I’ll be speaking at Infratects’ Top Gun US 2015 conference. I’ll be presenting on Essbase Hybrid Aggregation Mode, and I’m very excited about the opportunity. Rule #1: Show a live demo of something really interesting. Rule #2: Have some “giveaways” for people who ask questions. Top Gun US 2015 has some amazing speakers and should be a great opportunity to network with Oracle product management and your EPM peers. I hope to see you there!